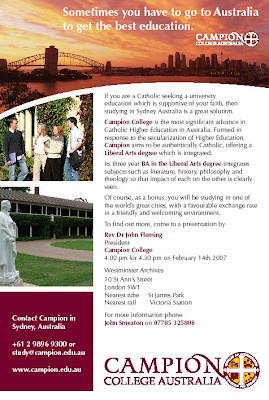 Fr John Fleming, the President of Campion College in Sydney, Australia, is coming to London next week, to give a talk about this Catholic College which enrolled its first students last year. The uniqueness of the programme lies in the integration of all of its courses. The subjects in philosophy, theology, literature, history and science are all studied so that the influences of each subject on the other is a fundamental part of the program. Thus when a student is learning ancient history, they will read the great literary works of the time, consider the philosophers of the same period and the theology of the Old Testament.